He's the perfect Olfactory Ambassador. 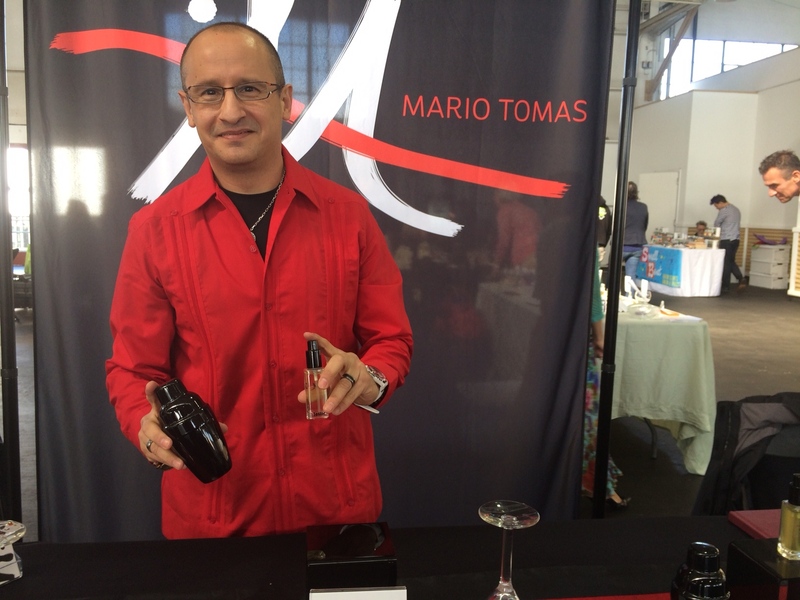 Meet Mario Tomas and you'll quickly learn he loves martinis. "Jerry my partner and I are known for our martini glass collection and our martinis," says the budding perfumer during his debut at the Artisan Fragrance Salon. This is the third year of the Salon in San Francisco, put on by TasteTV, the same people who bring you the International Chocolate Salon, held at the same time. 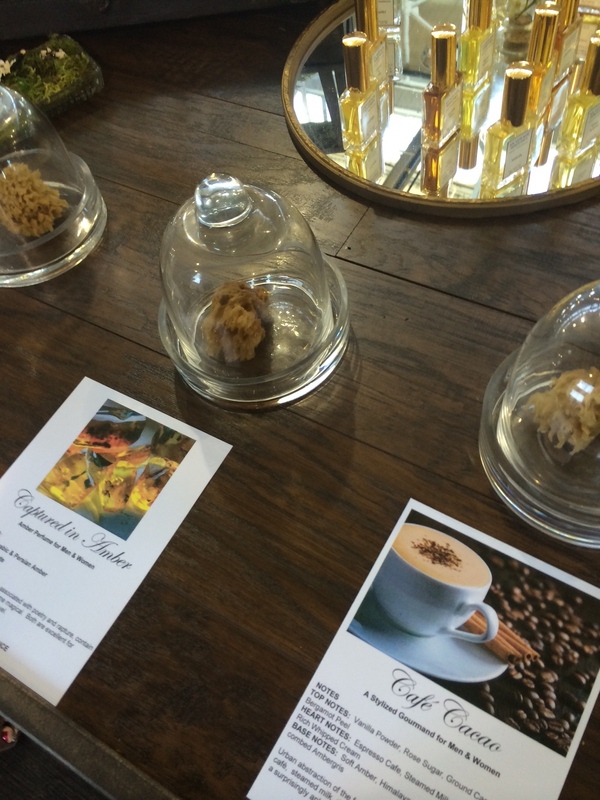 Many of the perfumers were inspired to create wickedly delicious chocolate inspired scents. Passionate, with an infectious smile and charming manner, Mario's new perfume line, Olfactory Ambassador, was an immediate hit with judges and fragrance lovers alike. I was one of the judges and I loved his packaging -- using mini martini shakers painted black as snifters for each of his three aromas. "Ever since a kid I've always loved fragrances," he says. I love Mario's story even more. "I remember my cousins and I sneaking into our uncle's room and while they were trying to look at the Playboys I was trying [my aunt's] fragrances." But in a twist there's another olfactory memory. I get a boozy character on the nose. Turns out that's tequila. Mario says, "My cousin has a tequila distillery and I just remember that smell." Another scent in the trilogy is Lo Mejor de Mi #1, the best of me, which combines Mario's love of citrus, iris and musk. It is light and ethereal. 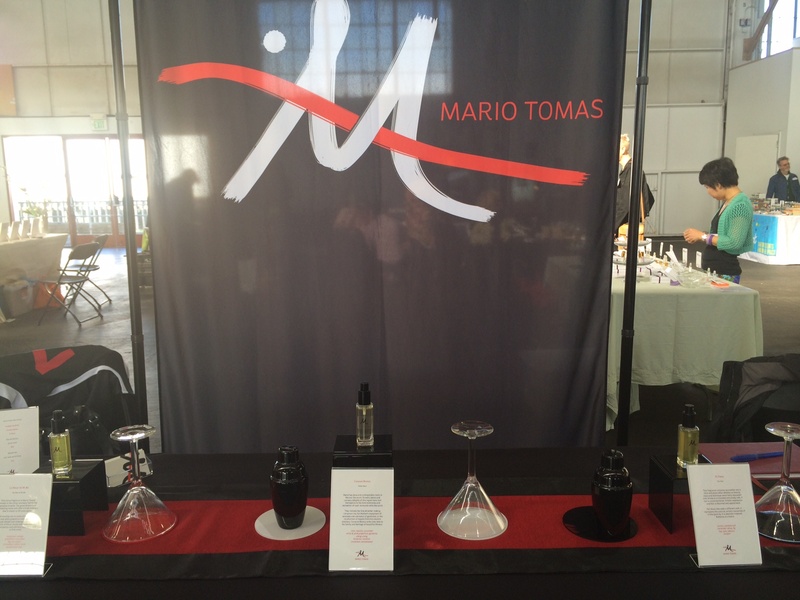 Under the Olfactory Ambassador guise, Mario racked up the awards, placing first with judges in the Best Packaging and Best Ingredient Combinations, and second in Best New Product. He was even more successful in the People's Choice Awards, winning Top All-around Product Line and Best New Product, and sharing the lead for Best Aroma, Most Unique, Top Artisan Perfumer and Most Seductive Scent. 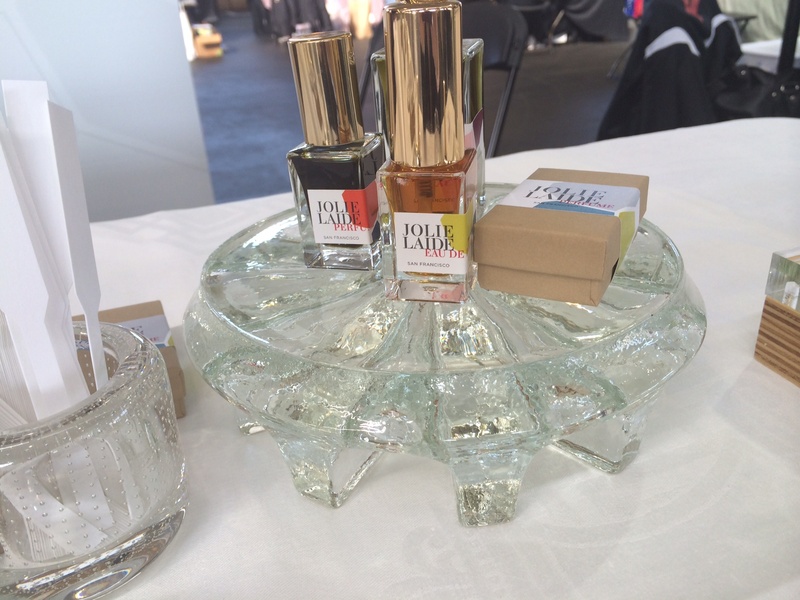 Shelley Waddington of En Voyage Perfumes debuted not one but three chocolate aromas. Shelly's a classical perfumer, but her creations are completely original. My personal favorite, perhaps IMHO the best scent in the show, is Indigo Vanilla. 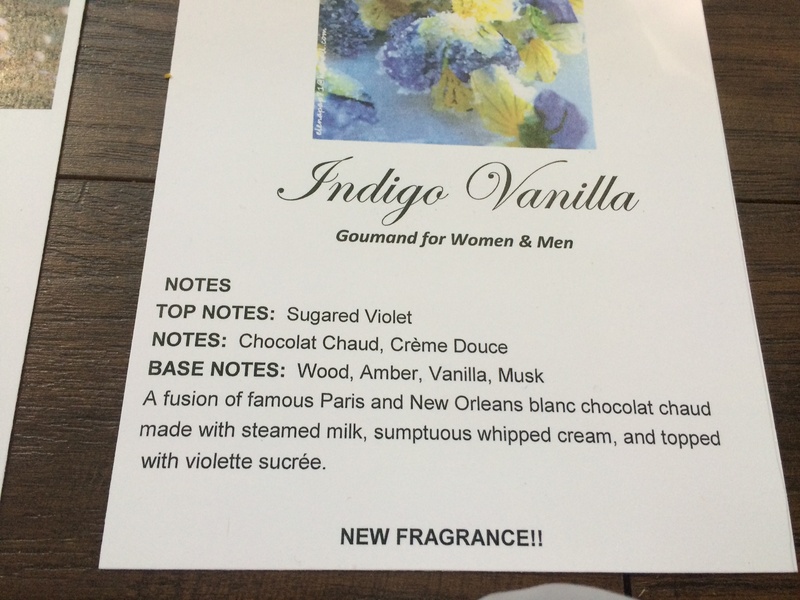 I love the contrast of the sugared violet notes with the white chocolate, vanilla and amber. It's rich without being too sweet. A whiff of Indigo Vanilla will cure any chocolate craving. The other two perfumes are Captured in Amber and Café Cacao, a mocha coffee lover's dream. Look for these scents to be available in May. Shelly is also a judge and people's award favorite, winning Best Aroma and Most Seductive scent from the judges and from salon attendees, Top Artisan Perfumer, Best in Salon and shared Most Seductive Scent with Olfactory Ambassador. At last year's Salon her new fragrance Zelda won the Top Artisan Fragrance Award for its lusty, sensual vivacious character, inspired by none other than Zelda Fitzgerald. Shelly captures the spirit of the roaring 20's in a spritz. It's really a flamboyant Chypre." While Shelly's been making perfume for 14 years, she says, "Zelda put En Voyage on the map." Even though lavender is the common note throughout the scents at Meshaz Natural Perfumes, this is not your grandmother's lavender. 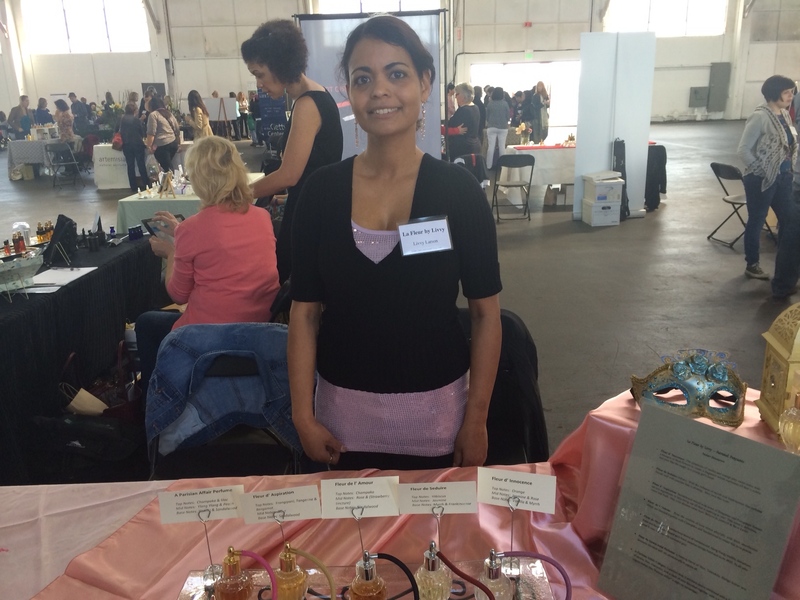 Mesha Munyan grows, harvests and distills her own lavender, using not one, but up to 14 varieties to create her portfolio of rather exotic scents, especially for lavender. Take Zauvage, a smoky, sultry, heavy fragrance. My inspiration for Zauvage began with a determination to push beyond my usual practice of coaxing the delicate, to one of engaging the bold, lusty and carnal. Ginger lily and exotic oud introduce this dark and sultry scent. Hearty Moroccan rose and jasmine sambac anchor a spicy accord of cardamon, black pepper and clove. Castoreum completes this tenacious floral animalic. The result is savagely unapologetic. In Abzinthe, the sweetness of the lavender flower interplays nicely with the anise note of Absinthe. 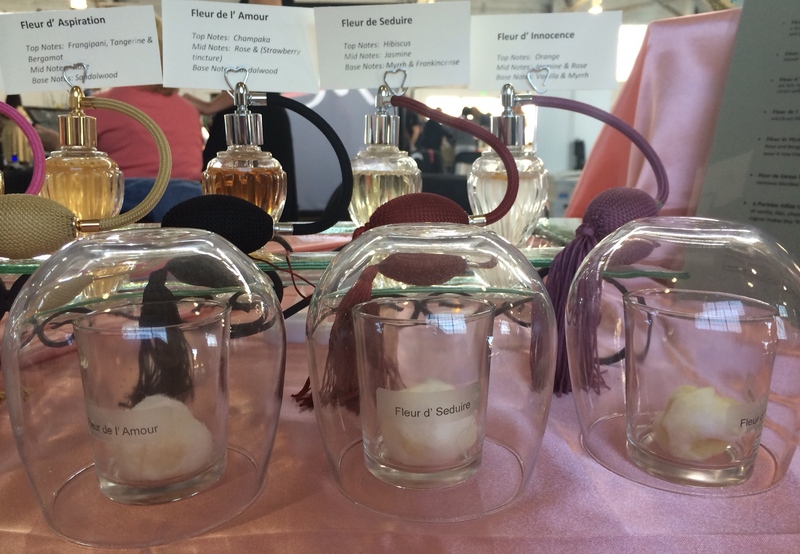 I noticed more Absinthe-inspired fragrances than anything else at this year's salon. The tension of something a little dangerous (Absinthe) and something a little old fashioned (lavender) is very attractive. You'll notice the letter "Z" replaces the letter "S" in the names of her fragrances. "I use the letter Z in my perfume names as a signature of completion after I have orchestrated a collection of naturally occurring scents," Mesha says. "They together become a new thing by design and name." Mesha's lavender farm is in Sequim, Washington, where she's been cultivating lavender for more than 20 years. While she grows 14 varieties, she says there are actually hundreds of varietals of lavender angustifolias prized in perfumery. "It has become a personal mission to let these variations be known and smelled," she says. 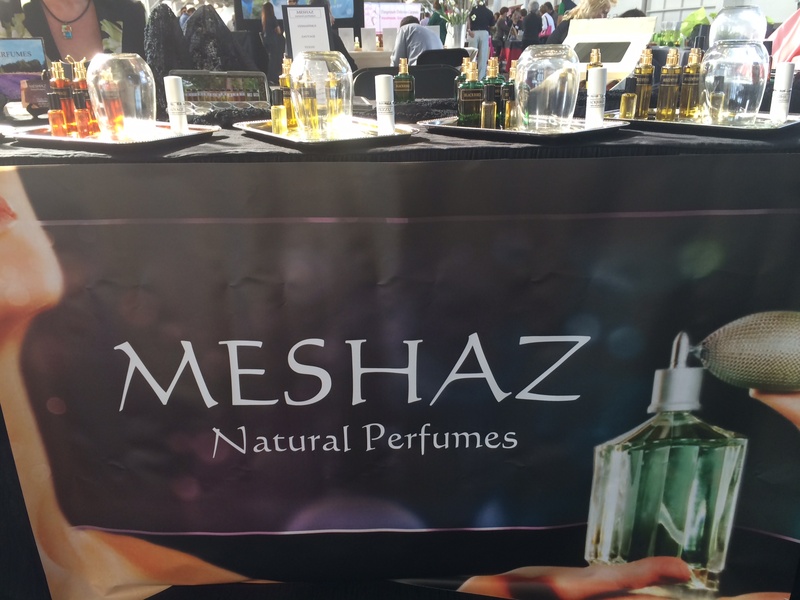 This is Meshaz's second Fragrance Salon; Mesha debuted her line in Seattle last year. Meshaz was one of the Judges top picks for Most Unique and she was one of the winners in the People's Choice for Best Artisan Perfumer. Another newcomer on the perfume scene is Jolie Laide, which translates from French as "pretty ugly." 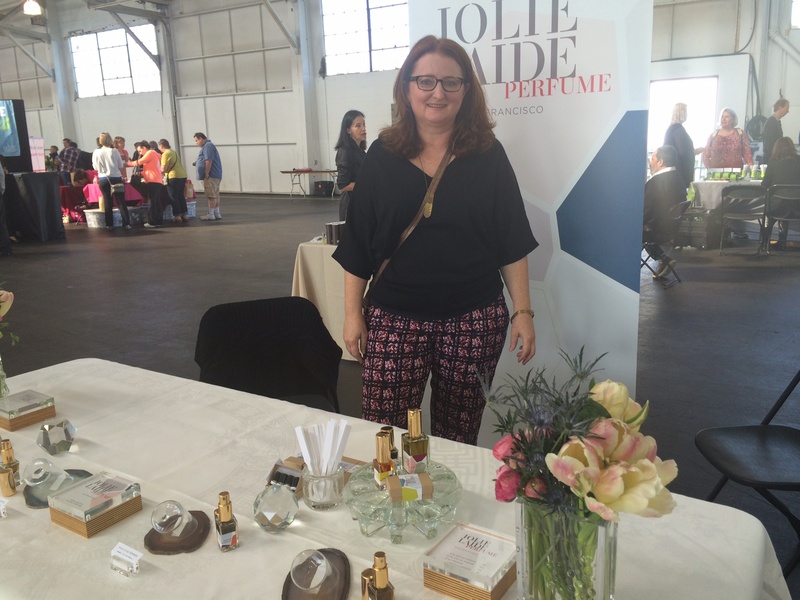 Heather Kaufman, the nose behind Jolie Laide says, "here's pretty things in perfume and kind of stinky things in perfume. Jolie Laide is also a French phrase that means unconventional beauty." 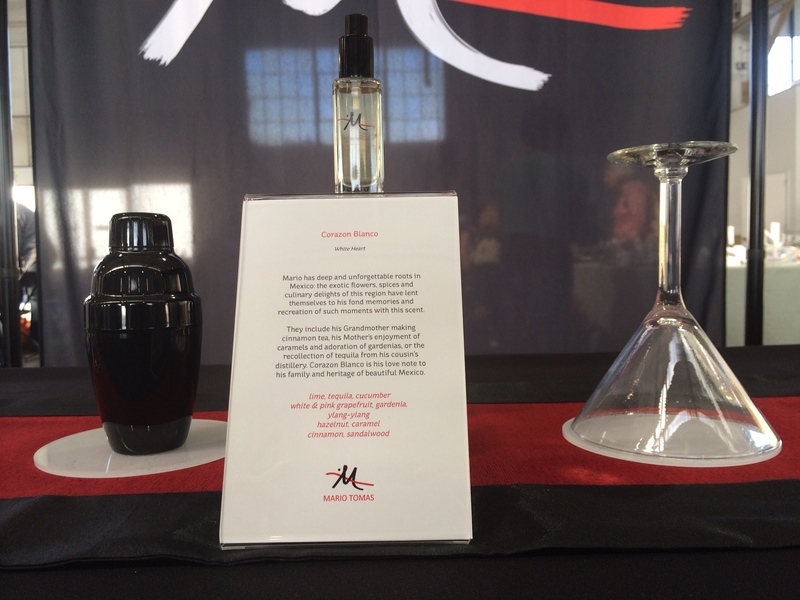 Heather first debuted her line at the Artisan Fragrance Salon in Seattle in May 2013. Her inspiration is French new wave films, with each of her four all natural botanical scents taking its name from a movie. "They have an innovative way of telling a story," Heather says. "I'm inspired by the ideas of that movement--their youthful spirit and intention of experimentation." My favorites are Baisers Volés, (stolen kisses) and Masculin Féminin. 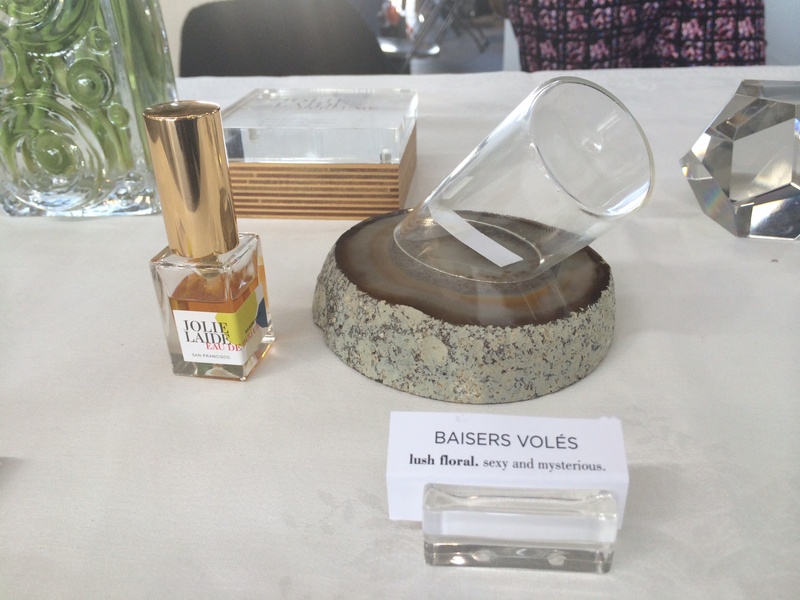 Baisers Volés is a clean white floral inspired by gardenia, but there's no gardenia in it, as it is difficult to distill the scent from the flower. So Heather uses cuda, "which is a big white spiky flower from India and it's got a horseradish-like top note but it's got a lovely floral underneath," she says. Pretty ugly. 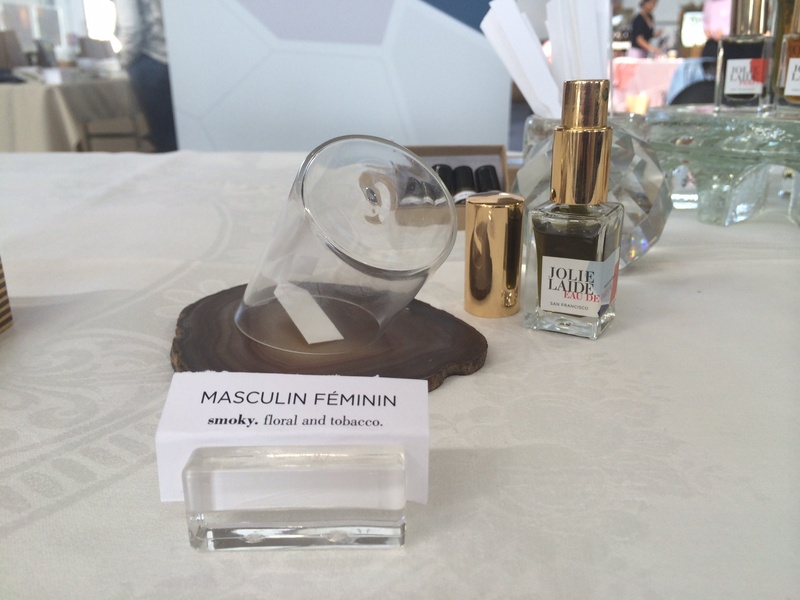 For Masculin Féminin Heather's mix of "smoky floral tobaacco with some tea notes with jasmine sambac mate and rooibos the smokiness is choa ral which is smoked vetiver." Jolie Laide got the nod from the Judges for Best New Product and Most Unique (one of four). 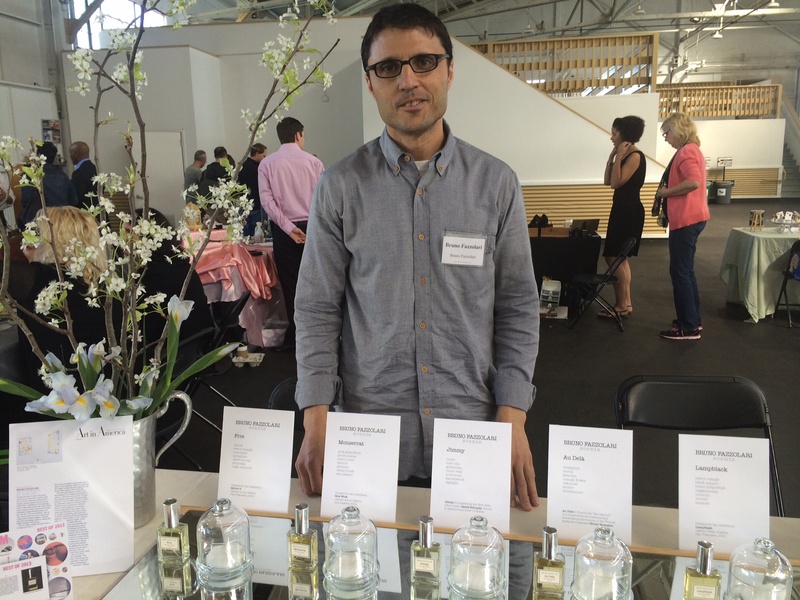 This is the second Salon appearance for San Francisco perfumer Michael Coyle (aka Mik) and his line Mikmoi. He's inspired by the many cultures he's experienced through traveling. His website is in four languages, English, Japanese, French and Mandarin Chinese. "What is interesting to me is when I'm researching where ingredients come from is what's the cultural background of those ingredients," Mik says. 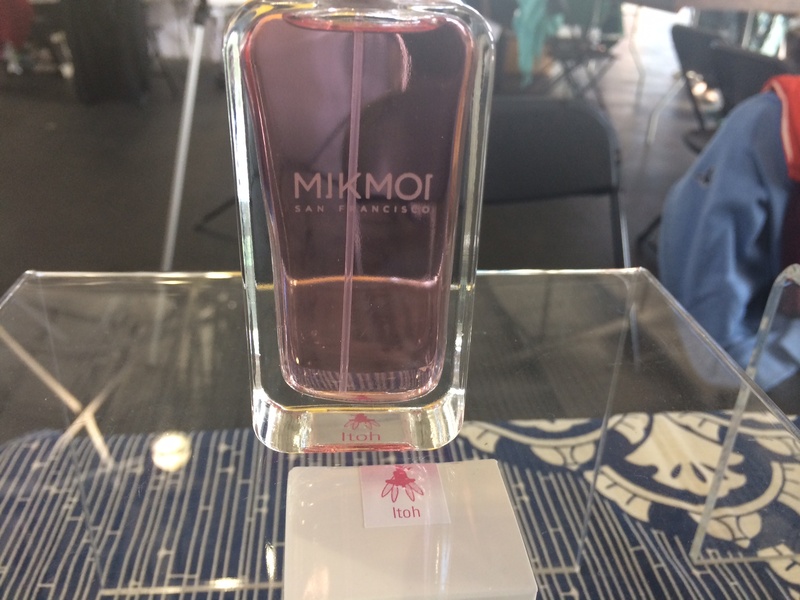 I'm a sucker for any fragrance with tuberose in it and Mikmoi's Ao is no exception. Mik says Ao is the Thai word for bay. "This is a Thai ginger tuberose which is reminiscent of the beach bonfires on the beach in Thailand," he says. The sultry tuberose mixes with coconut juice and amyris for a tropical, exotic aromatic experience. New for Mikmoi is a collection of solid scents that he calls portable cologne sticks. "These are based on the five elements," Mik says. The names are in Japanese: Do for earth, Ki for wood, Ka for fire, Kin for metal and Sui for Water. I love how smoky Ka is, with Lapsang Souchong tea roasted over pine needles. 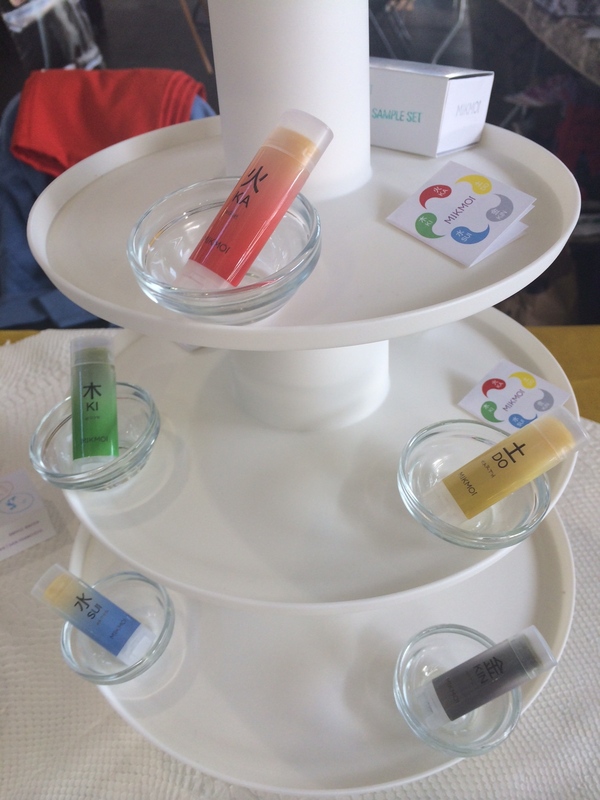 The Judges voted Mikmoi the Top All-Around Product line and Mikmoi was also one of the People's Choice winners. Bruno Fazzolari is a multi-talented artist. He's an accomplished and critically acclaimed painter and a new perfumer, creating bold canvases and bold fragrances. 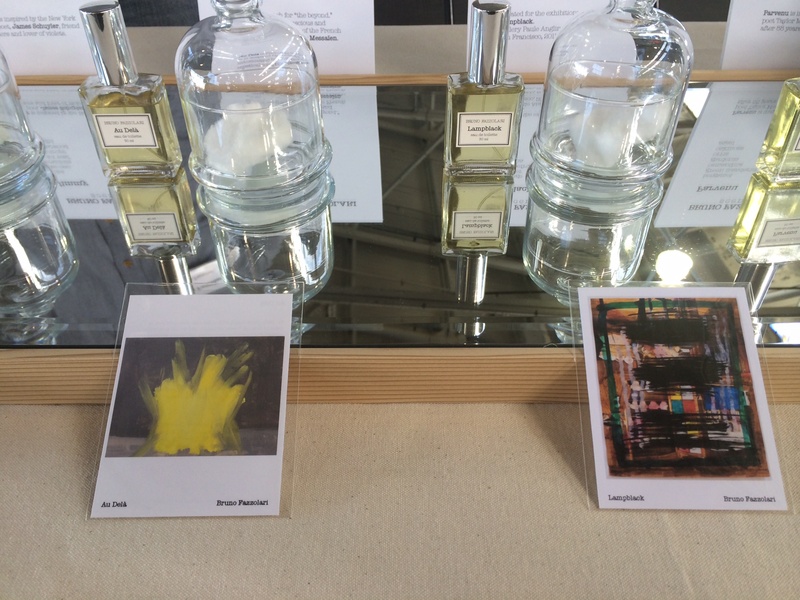 I love his concept of pairing his scents with his artwork. Bruno includes what he calls a "trading card" with each scent that has words and a specific image chose for the fragrance. His perfumes are also becoming critically acclaimed. At the Salon, the Judges awarded Bruno Fazzolari Editions the gold for Top Artisan Perfumer and Best in Salon; he shared gold with four other perfumers for Best Packaging. Bruno takes risks in his painting and he takes them in crafting his perfumes. Take Lampblack, a scent inspired by the black carbon based pigment in India ink. Bruno created a series of paintings done in India ink. The particular work he chose to pair with the fragrance has dense swatches of lampblack ink almost obscuring other colors of blue, red, green and magenta. The fragrance reflects this abstraction, with smoky inky aromas mingling with spice and fruit. It is startling and surprising and completely original, an alluring blend of sweetness and smoke. Jimmy is just the opposite, a joyful, fresh violet floral with a hint of spice. Bruno says he was inspired by "the work of the New York School poet, James Schuyler. References to violets and violet cologne appear frequently in his poems." He says he was reading a lot of Schuyler when he created the accompanying painting. 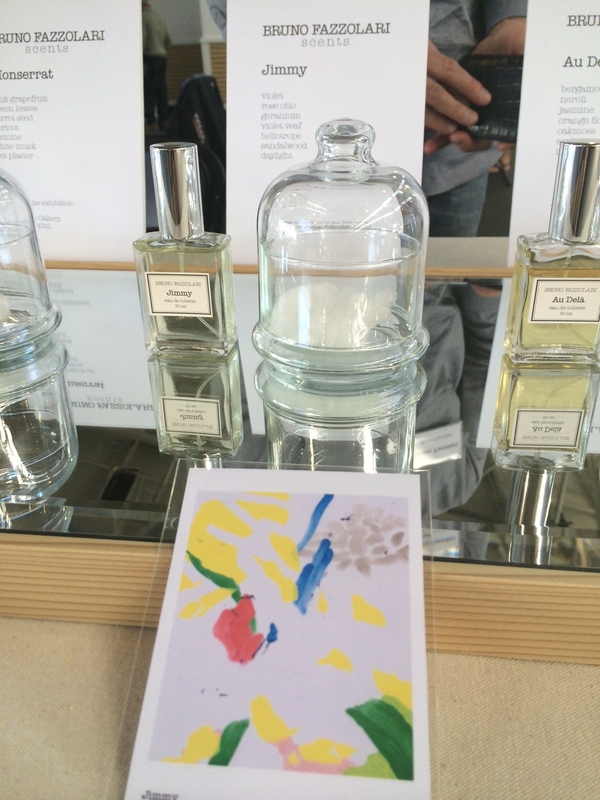 Each painting paired with a particular fragrance "reflects the spirit of the perfume." I was totally charmed by Olivia "Livvy" Larson of La Fleur by Livvy, making her debut at the Artisan Fragrance Salon. Her natural fragrances represent phases of a woman's journey through life. With Fleur d'Aspiration its all about confidence in yourself and having your dreams come true. The scent itself was inspired by Livvy's memories of being in her grandmother's bedroom in India, where there was a frangipani tree outside the window. When the window was open the blossoms would float into the room and Olivia remembers that scent to this day. Fleur de Mystere is for creating a veil of mystery, with peach, sandalwood, ylang ylang, vanilla, geranium and rose. A Parisian Affair with lilac, champaca and and Cognac evoke a sweetly romantic evening in Paris. I love that the packaging is very girlie, colorful bottles with atomizers and smaller blue heart-shaped bottles. You can tell there is a lot of heart and soul that Livvy puts into her perfumes, and she's off to a good start. The Judges voted La Fleur by Livvy one of two silver medal winners in the Best Ingredient Combinations category. For a complete list of all the Artisan Fragrance Salon Awards click here.